Innovations allow us to build stronger, safer, taller wood buildings using high tech or engineered mass timber. By encouraging innovations in building with wood – an abundant, renewable, and domestic building material – we can help architects, builders, and communities reduce their environmental footprint while supporting job growth, rural economies, and the sustainability of our nation’s forests. Mass timber buildings are constructed using high-tech or engineered wood. 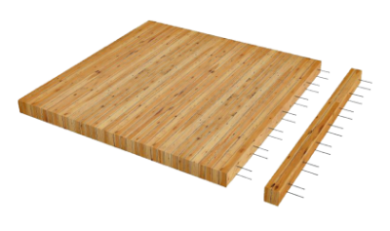 The term “mass timber” includes several types of products for floor and wall framing such as cross-laminated timber, nail-laminated timber, glued-laminated timber, and structural composite lumber. Despite being safely used in Europe for decades, the United States is way behind in use of mass timber to construct tall wood buildings. 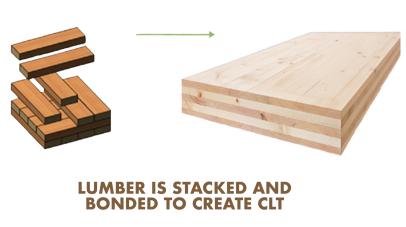 CLT products were developed in Europe over 20 years ago but are relatively new to North America. TIA is the jumpstart needed to get tall wood buildings off the ground in the United States. TIA provides designers and code officials with the research they need, helping to deploy more options for safe, durable, and efficient building construction. TIA encourages investment in the manufacturing facilities needed to produce mass timber products domestically bringing jobs to rural America, and stimulating the forest economy. TIA incentivizes the construction of buildings with a domestic, renewable resource that sequesters carbon. LET’S LEVEL THE PLAYING FIELD AND GIVE MASS TIMBER PRODUCTS A FAIR OPPORTUNITY TO COMPETE IN THE MARKETPLACE. Authorizes USDA, in cooperation with state foresters and state extension directors, to provide technical assistance to mass timber applications. Incentivizes the retrofitting of existing facilities to produce mass timber products in areas with high unemployment rates to spur job creation in rural areas. Directs existing federal grants for education, outreach, research, and development of mass timber products. Authorizes the Tall Wood Building Prize Competition to continue through USDA for the next five years. Directs the Forest Service to act on their mandate without creating additional cost to the taxpayer.